Could this be the moment, the turning point, the time when the Bulls really are back. After all, with Friday’s 128-121 overtime win over the Phoenix Suns, the Bulls haven’t lost a game in almost two weeks and haven’t lost at home in four weeks. So they’ve only played three games at home the last month, and so they just came off an All-Star break with seven off days. OK, I am the guy who tells everyone, ‘See you next year,’ on New Year’s Eve. But, hey, it is three wins in a row and back to .500 at 29-29. “Now got to string some together, like I’ve said like 15 times this season,” said Jimmy Butler, whose two clutch jump shots at the end of regulation rallied the Bulls back from a late fourth quarter 11-point deficit. "Three games in a row found a way to win. That’s what this team is all about; obviously, we have a tough back to back (Saturday) against the best team in the East (Cleveland). But tonight was about taking care of this game." And so the Bulls did and move on in this most unpredictable of seasons, both searching for the playoffs and their future amidst Thursday’s traumatic trade of Taj Gibson and Doug McDermott. It ended a long All-Star break and started a stretch run for the 2016-17 season. New players coming from the Oklahoma City Thunder Cameron Payne, Joffrey Lauvergne and Anthony Morrow did not play. Some could play in Cleveland Saturday. So it was yet again another rotation and group of new starters with Bobby Portis taking over for Gibson at power forward. Michael Carter-Williams got the start at point guard, ostensibly for his size on defense. 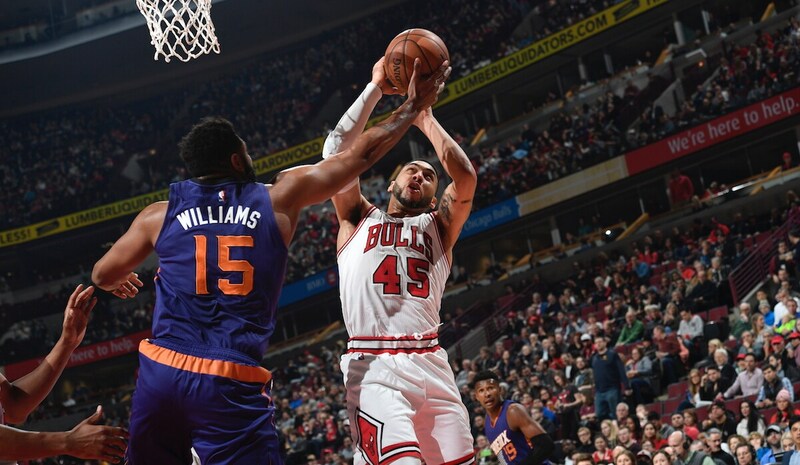 Though it was rookie Denzel Valentine moving into the McDermott role who was crucial off the bench with 15 points and five of eight three pointers. Nikola Mirotic, who was speculated as the most likely to be traded, tied his season high with 20 points as he and Valentine combined to shoot nine of 15 on threes. The Bulls were 12 of 26 overall on threes with 31 assists. Robin Lopez had 19 points and Rajon Rondo tied Butler with a team high nine assists. Portis had nine points and seven rebounds in 16 minutes. But it was Wade with a team high 23 points, a key late regulation steal and overtime slam dunk that raised the United Center roof, and Butler with those Superman late jumpers after struggling much of the game and overtime steal and his own dunk. In their own way, they were the blues brothers, making the Suns sing a sad song after having led 102-91 with less than five minutes remaining in the game. 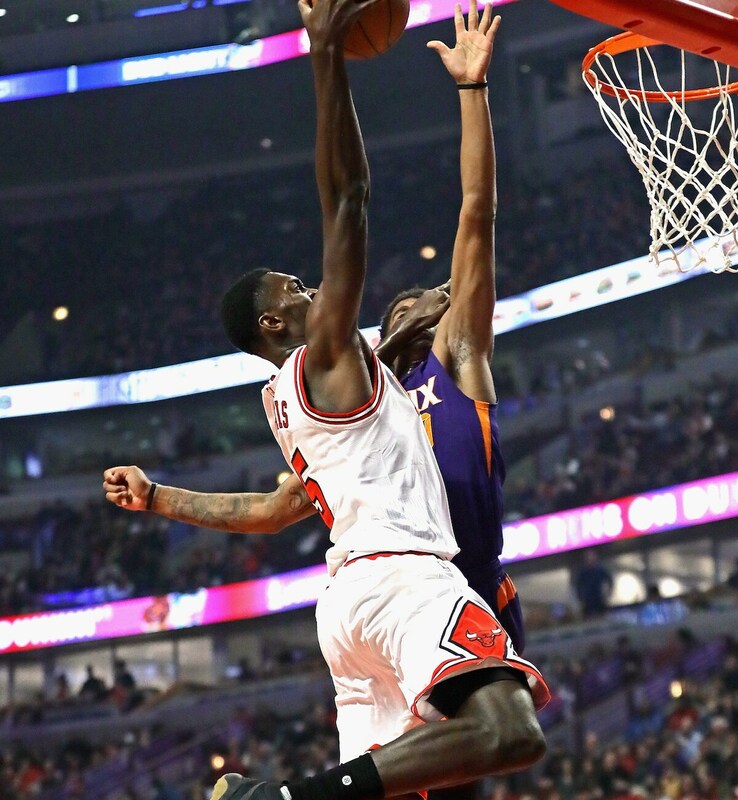 Butler did again in a game that seemed lost, the Bulls outrun and outshot by the Suns most of the game, trailing by 13 points late in the third quarter as well and seeing the Suns score 27 fast break points with 52.7 percent shooting for the game. How do you even stay close with Butler and Wade a combined six for 19 for 17 total points through three? But it was Butler with a step back three with 48.2 seconds left in regulation that tied the game at 106 and then Butler again with 9.1 seconds left with a 13 foot baseline fadeaway for a 108-106 lead after Wade stripped the ball from a driving Eric Bledsoe. It then was almost a night and day of referee angst as Wade was called for a three-shot foul on Suns high scorer Devin Booker with 1.5 seconds left. Make three and the Suns likely win on the late call that seemed highly questionable. Replays clearly showed Wade not hitting Booker with his body or hand as Booker went up and then only incidental contact after the shot was well off. That’s not considered a foul. But then Booker, who led Phoenix with 27 points, missed the third free throw to send the game to overtime. The Bulls dominated there, leading the entire five-minute session highlighted by Wade’s hesitation dribble up late and then driving dunk over center Alex Len for a 126-117 lead with 41.6 seconds left. Wade did a little raise the roof pantomime afterward, Butler laughing later and saying Wade needed to be back on defense and quit all the celebrating. Just like this Bulls team that looked lethargic back from the long week off, Wade not having played with injuries and illness for two weeks. It would be easy to accept the distraction of the trades and the latest rotation, but the Bulls came back strong to beat a Suns team that blew out the Bulls in Phoenix earlier this month. And also thanks to the play of Valentine with three of four threes in the third quarter when the Bulls came back from a big deficit to lead 80-79 after three quarters. Valentine was a plus-25 for the game in time on the floor with Mirotic a plus-23. Butler was next high at plus-13. The Bulls trailed 25-24 after one quarter, down 19-10 to start before Lopez scored inside. The Suns moved out ahead 37-28 in the second quarter before Jerian Grant and Portis’ threes enabled the Bulls to get within 54-52 at halftime. The Suns looked like they’d break it open going ahead 75-63 midway through the third quarter before three Valentine threes in four Bulls possessions. And yet again, the Suns took control, 102-91 late in the fourth before a Mirotic three (he had another in overtime) and Butler taking over down the stretch. It was Valentine, of all guys, who rarely has played until now with the McDermott trade, encouraging Butler. "I like Denzel. He wants everybody to do well and sometimes he gets lost in the fact he’s a hell of a player as well. That’s what you get when you have a great teammate. He played huge tonight and I hope he keeps that same confidence tomorrow and takes the same exact shots every single time." Valentine says he will, but that’s not all he is. Sounds like a guy ready to take charge of a role, which is what the Bulls like to hear. They may see some of their new guys Saturday, though Morrow fended off his first controversy when he disclosed on his Twitter account he was giving up his No. 1 Bulls jersey he took because of criticism from some fans on Twitter about it being Derrick Rose’s old number. The same thing happened when Michael Carter-Williams arrived. Payne took Gibson’s No. 22, which was his number in Oklahoma City. Gibson took that number with the Thunder. McDermott got No. 25. Do they have one more big, long run in them?